Paul Durand-Ruel was a visionary art dealer and the champion of the new Impressionists who were subject to severe art critics and rejection. After the Impressionists had become famous internationally, during the time of economic downturn, Paul Durand-Ruel was literally saved by the Impressionists whose paintings were particularly loved by the rich Americans. In this extraordinary exhibition, there were paintings from museums all over the world including Musee d’Osay, Museum of Fine Arts Boston, Metropolitan Museum of Art etc. They were paintings of Monet, Renoir, Degas, Manet, Pissarro. Although I had seen many Impressionists’ work in various museums in the United States and Europe, it seemed to me that these were the extraordinary arising from the ordinary. 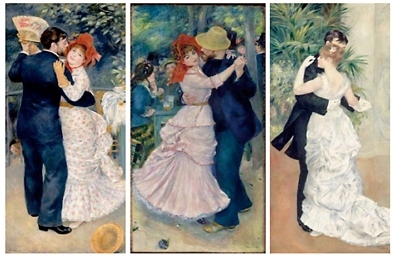 My favorites are these three Dance paintings of Pierre-Auguste Renoir. The Dance at Bougival was the one I had not seen before. The other two: Dance in the Country and Dance in the City, which I saw some years ago at Musee d’Osay have always been my favorites. To me, it was an emotional moment to see the three reunited. These three paintings were bigger than life-size. My eyes were glued at them for a very long time. I thought, when will they meet again after the show? When will I see them again? Hey, my friends! Bored by my self-muttering? Let’s have some fun. Here’s a trivia question for you. What music did you hear? Please share with me!